SEATTLE--(BUSINESS WIRE)--(NASDAQ: AMZN)—The Bureau of Labor Statistics projects that by 2020 there will be 1.4 million computer-science-related jobs available and only 400,000 computer science graduates with the skills to apply for those jobs. Computer science is the fastest growing profession within the Science, Technology, Engineering or Math (STEM) field, but only 8% of STEM graduates earn a computer science degree, with a tiny minority from underprivileged backgrounds. Also according to the Bureau of Labor Statistics, the average computer science major makes 40% more in lifetime earnings than the average college graduate and nearly three times more than the average high school alumna. Despite the opportunity, the vast majority of public elementary and high schools, particularly those in less advantaged communities, do not offer computer science classes. Today, Amazon is launching Amazon Future Engineer (AFE), a comprehensive childhood-to-career program to inspire, educate, and train children and young adults from underserved and low-income communities to pursue careers in computer science. Amazon aims to inspire more than 10 million kids each year to explore computer science through coding camps and online lessons, fund introductory and Advanced Placement (AP) courses in computer science for over 100,000 underprivileged young people in 2,000 low-income high schools across the U.S., award 100 students from underserved communities pursuing degrees in computer science with four-year $10,000 annual scholarships, as well as internships at Amazon to gain work experience. For kindergarteners through 8th graders, Amazon will fund free, fun, and inclusive computer science online lessons and camps through partnerships with organizations such as Code.org and Coding with Kids. Designed by experts, these lessons and camps will provide underprivileged students in hundreds of communities across the U.S. an opportunity to discover the potential of coding in an interactive, hands-on way. Children and young people who participate in these activities are more likely to say they like computer science and have confidence in their computer science abilities. Students and parents can apply for summer camp scholarships here. For students in high school from 9th to 12th grade, Amazon will provide funding to schools, focusing on low income Title I and rural schools, to offer Intro to Computer Science and AP Computer Science courses. 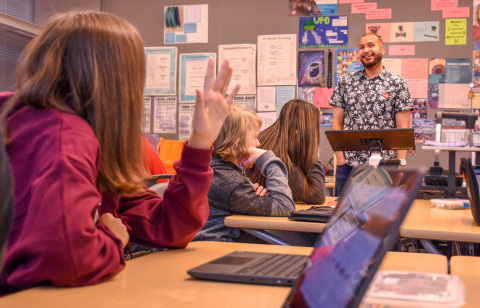 The program seeks to dramatically expand access to high-caliber preparatory courses, curricular resources, and programs for schools and districts to help prepare and propel high school students forward in their pursuit of computer science education. Underprivileged students are 8 to 10 times more likely to pursue college degrees in computer science if they have taken AP computer science in high school. The program is already open for applications and interested schools can apply here. For college students, Amazon will offer $10,000 per year, 4-year “Amazon Scholar” college scholarships for individuals from underserved communities who are pursuing an undergraduate degree in computer science. Scholarships are available to young people who have successfully completed an AP Computer Science course and are pursuing a computer science degree at an accredited four-year university. The program is now open for applications with funds available for students starting in Fall, 2019. Students can apply here. College freshman students who received a scholarship from Amazon will be eligible for a paid software development internship at Amazon. Participants will partner with a technical mentor and manager, as well as other interns, to innovate and create new features and services on behalf of Amazon customers. Scholarship recipients will begin their internship in summer of 2020. Amazon Future Engineer is a comprehensive program aimed at inspiring 10 million underprivileged students each year with computer science education.